HA NOI — Fifteen people, including 14 foreigners, kick-started their classic Soviet motorbikes in Ha Dong District on Wednesday and began their journey down the Ho Chi Minh Trail after raising more than US$40,000 for disadvantaged Vietnamese children. Funds from the rally were donated to the Blue Dragon Children's Foundation, an Australian charity aiming to make a lasting change for kids in crisis. 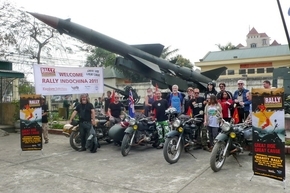 Riders from Australia, the US, England, Sweden, and the Philippines and Viet Nam will all ride fully restored Soviet-era Ural motorcycles to Hoi An via the historical trail before finishing their trip in HCM City next Saturday. "It's a good cause, so we signed up for it. Last year I took a motorbike ride from Ha Noi down to HCM City. I like Viet Nam and I like motorbiking," said Allan Lewis, a dentist from Reading, England. Chris Cunningham, a postman from Brisbane, Australia, said he hoped to learn about the country's history, particularly the wars, see the countryside, experience the culture and taste the food during his first visit to Viet Nam. "The ride should be quite an adventure and a bit of a challenge. I'm looking forward to it," said Mil Clayton, also from Brisbane. The 20,000km-long trail was a logistical system running from the north to the south of Viet Nam through Laos and Cambodia during the American War from 1959 to 1975.